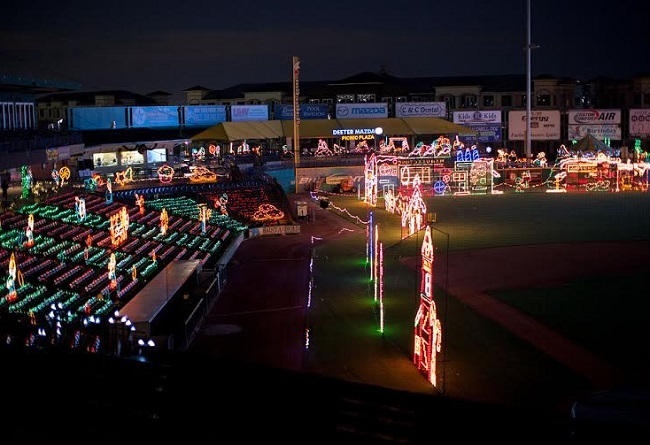 For the second-straight year, the Sugar Land Skeeters will host Sugar Land Holiday Lights from November 27 throughJanuary 3 at Constellation Field. The showcase of lights will include eight all-new themed areas and multiple holiday vendors with general admission at $14. Discounts are available for children under 13, military personnel, seniors (55+) and groups of 10 or more. “We are excited to continue our year-round entertainment at Constellation Field and bring this family-friendly event back to our community,” General Manager Chris Jones said. The event hosts a 2.5 million light walkthrough display, along with multiple holiday craft and trade vendors. Santa Claus will be available at Constellation Field as well. Photo opportunities with Santa will be available from November 27 through December 23. A complete list of vendors will be released at a later date. Sugar Land Holiday Lights also offers fundraising opportunities. 501C-3 organizations that wish to participate will receive a promo code to take $2 off a full-price ticket and a portion of the proceeds will be donated back to the organization. To sign up for fundraising or to become a vendor, email HolidayLights@SugarLandSkeeters.com or visit SugarLandHolidayLights.com. Season tickets for the 2016 campaign, along with special eight game mini plans are on sale now. Call the TDECU Ticket Office at 281-240-4487 to join the swarm today. Visit SugarLandSkeeters.com and follow @SL_Skeeters on Twitter, Instagram and Facebook for all the latest news on the team. The Skeeters play 140 regular season games in the Atlantic League, considered the highest level of Minor League Baseball. Atlantic League players are “Major League ready” and in the last 17 years, over 600 players have graduated from Atlantic League clubs to Major League organizations, making the League a preferred route for experienced players to be scouted by Major League Baseball.